Samsunghyeol the Origin of Jeju: Where will the future lead? On May 3rd, 2014, The Jeju Weekly Junior Journalists visited Samseonghyeol to interview visitors and collect various opinions about how to make Jeju an international city. It was a sunny spring day with many visitors enjoying the fresh air. It was an opportunity to feel like they were in a forest amidst the busy street and in a place where Jeju’s history began. The three original ancestors were named Ko, Yang, Bu They came out of three hole in the ground and built up countries, respectively. Around the three holes are trees that seem to give the park a mysterious mood. 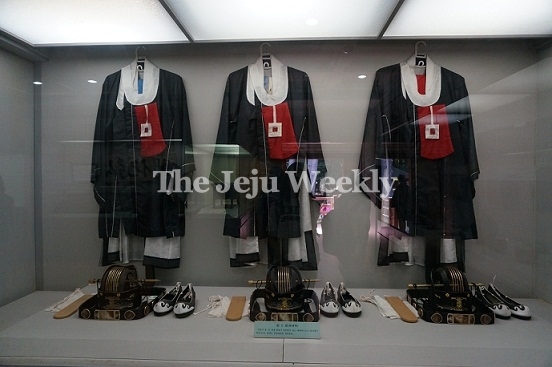 There is an educational video available to help visitors learn about history of Samsunghyeol. The first visitor interview was a Chinese woman who introduced herself as a tourist. She was asked to give her opinion on how Jeju could become and internatioal city. Surprised, she said “Isn’t it already a international city? I like this place because it preserves some of the old things.” She also added, “I came to this place 4 years ago with my tourist guide. I liked this place so much so I came here by myself again.” When asked if she would like to see advancements made to Samsunghyeol she said didn’t feel any need. While walking around the park, breathing fresh air and politely asking for interivews, it was obvious that not everyone wanted to talk about Jeju as an international city. A park ranger who was interviewed decided he wanted to have a personal conversation instead. Last, a 33 year old a office worker who was visiting with his wife and baby shared that he likes Jeju and has visited Jeju several times. And the natural beauty of Jeju allows for lots of places to rest. He said “ Jeju is trying to be an international city to attract foreign companies, right? Then, foreigners should think that Jeju is a great place to live. In terms of relaxation, I think Samseonghyeol can play an adequate role of a forest in the city to people tired because of hard works on weekdays.” He added that he visited Samseonghyeol to see where Jeju originated from because he always read about iit in textbooks. Visitors had varying opinions about Jeju as an international city, from it’s already an international city and it doesn’t have any more room to grow to Jeju can improve its image by promoting tourism and other related industries. Additional to Samseonghyeol, there are many attractions where tourists can experience the charms of Jeju. Promoting Jeju as an international city is happening and South Korea is doing its best to perserve this special place. including nominating it as a heritage.